class mammalia: 3 middle ear bones, hair, and the production of milk by modified sweat glands called mammary glands. contains over 5000 species placed in over 26 orders. 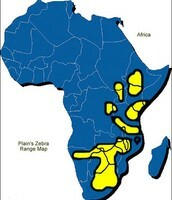 The yellow area on the map is where the burchell's zebra's habitat is. The Burchell's Zebra only lives in Africa. As you can see this baby zebra is with its mother. That identifies it as a young girl zebra. You can identify that because its staying by its mothers side. in this picture this zebra is in its natural habitat. The teeth that zebras have make it very easy for zebras to eat this grass. Height: On average, A zebra's shoulder is around 42-61 inches off the ground. 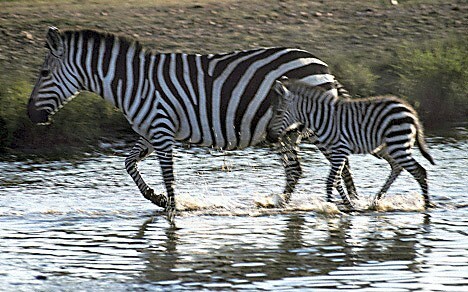 Color: The zebra could be black with white stripes or white with black stripes. 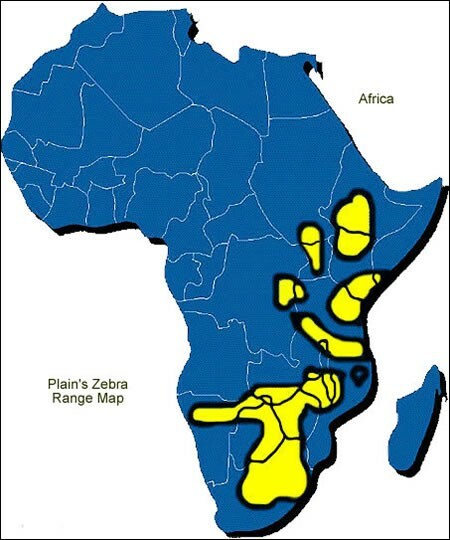 Natural Range: Most zebra's are located in Africa but the burchell's Zebra is mostly in the yellow area on the picture of the map. Diet: Zebra's eat mostly grass, leaves, and twigs. 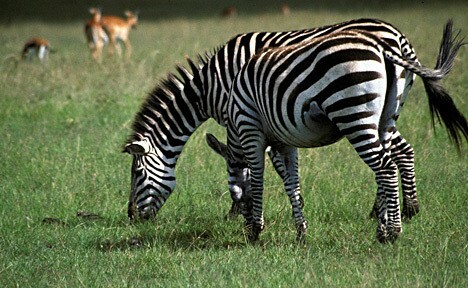 Habitat Description: Most zebra's live in savanna's or grasslands. Predators: Zebra's biggest predator is a lion. Zebra's are also hunted by hyenas. To a lesser extent they are hunted by dogs, Leopards, and Cheetahs. Zebra's have shiny coats that dissipate over 70% of incoming heat. This helps this animal protect its body from getting to hot and dehydrated from the suns rays. The stripes on a zebra are a from of camouflage. Even though you can see them very well in the day time but when it's night time you can hardly see the zebra. A zebra has a very strong and muscular upper jaw. This helps this animal with chewing its food. A zebra can run up too 55 MPH. this can or could help this animal from running away from predators and making sure that they stay with their young. As a baby zebra, if its a girl its mostly stays with its mother but on the other hand if its a male its mostly stays with its father. this helps them learn what to do when their older and learn characteristics. When a foul is born the mother keeps all other zebra's (even family members) away from it for 2 or 3 days, till it learns to recognize its mother by by sight. This helps this animal with learning how to use its senses. As a foul, if its a female it stays where it was born for 18 months, but a male foul stays where it was born for 2 years. this helps this animal not get eaten when its young, so when its around 2 years it starts going out with it's mother or father. v.1 (AAR-BAR) (3rd ed., pp. 3009-3011). New York, NY: Marshall Cavendish.